There's a lethal problem at the Allen Dairy Farm, and no one can pinpoint the source. After millions of dollars, a series of misfortunes and the mysterious sickness and death of numerous cows, farm owner Russ Allen discovers the trouble with his livestock was brought on by electrical pollution of the earth??????????? ?a major quandary throughout the dairy states.The source of this deadly stray current is a local utility giant who refuses to acknowledge its guilt and mitigate the problem. To safeguard his legacy and stand up for an environmental issue plaguing the heartland, Allen's final attempt to save his family's farm brings the utility into a gripping winner-take-all courtroom battle. 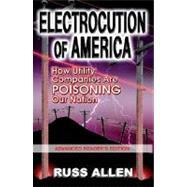 In Electrocution of America, Russ Allen tells a timely tale of corporate greed that is paid for with the nation's livestock??????????? ?a staple in the food chain.